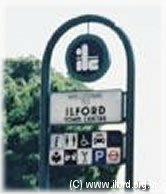 "Welcome to Ilford Town Centre"
Ilford Retail Park is opposite the police station and has a Fitness First centre and a Farmfoods. There are a few small nightclubs on this road (Magnums, the Liquid Rooms and Harlequins) and a couple of pubs (including the General Havelock). Don't walk around Ilford High Road and the immediate surrounding area late at night if you are a lone female. Just like all town centres in and around London, Ilford has its fair share of crime.